Time for the fourth and final review of the week for this eighth and final review of June! 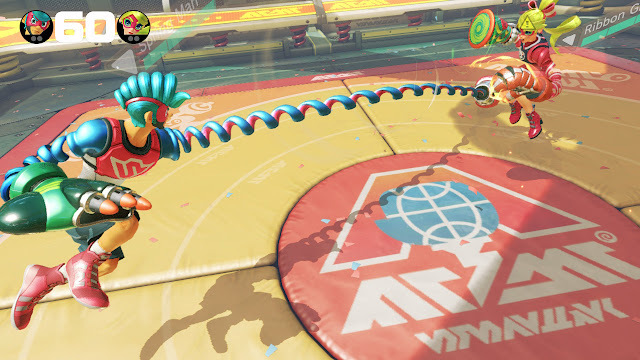 It's ARMS, and SuperPhillip Central has an in-depth review on Nintendo's big new Switch IP! Let's take a look at it together with my review. These ARMS get a little sore after awhile. With the Nintendo Switch, the hype behind Nintendo's home console market is back with a vengeance after an ultra-embarrassing run with the Wii U. Outside of one of the best games of the year (and for some, of all time) with The Legend of Zelda: Breath of the Wild, Nintendo's focus early on with its new console is multiplayer. We've already seen Mario Kart 8 Deluxe, Splatoon 2 is on the way later this summer in July, and now a new multiplayer fighting franchise is out under the name of ARMS. Is Nintendo's newest major IP a knockout blow? Well, not quite. First and foremost, this isn't your typical fighting game here. Nintendo has once again taken a familiar concept and genre and turned it on its head to make a wholly experience experience. Rather than brawl with normal punches and kicks up close as well as attacks from faraway, the fighters in ARMS stretch and launch out their literal arms at opponents as their means of offense. The arms then swing back in place like elastic. Not a typical way to attack in video games, but ARMS isn't your typical fighter. Players choose from one of currently ten characters, select from a set of Arms with different abilities and elements -- one for each hand -- and get thrust into behind-the-back combat against their opponent or group of opponents. The goal in traditional battles is to whittle the enemy's health down before hitting that knockout blow, and you can do this in a variety of ways. ARMS is a game of reflexes, strategy, and concentration. You can't just wildly swing punches and expect to win. When you launch an Arm, you're open to attack. Yes, you can still move around, but your options for evasion and defense are lessened. While one of your Arms is out, your opponent can take the opportunity to evade and counter with their own Arm attack, or worse yet, grab you by launching both of their Arms at the same time for a great deal of damage at your expense. Movement is key in ARMS, as you don't want to telegraph where you're going to your enemy, so a combination of dashing and jumping is required. It's also fantastic to see that every move in ARMS has a counter to it. The game is properly balanced from the get-go. If you are one to hide behind a guard to block punches, you can easily get grabbed. However, if you're spam-happy with grabbing, all it takes is one punch to your oncoming grab to block it. While Twintelle's grab attempt has made her vulnerable, Spring Man can take advantage with an attack. This goes with the titular Arms in ARMS as well. 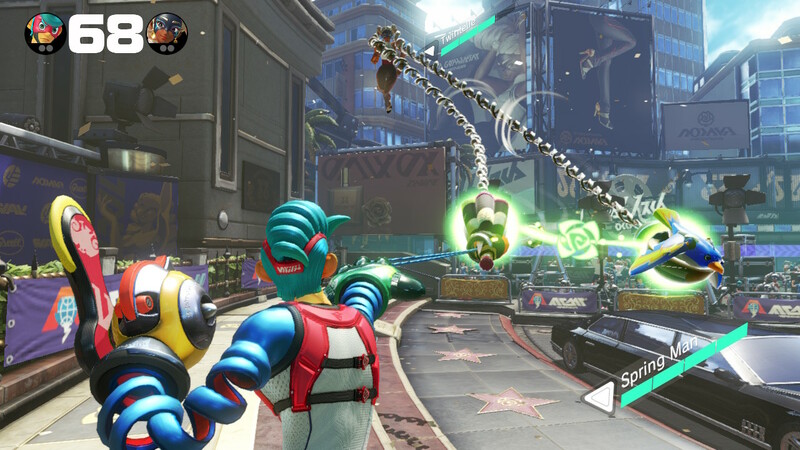 In the game, Arms have numerous abilities, advantages, and disadvantages to consider. For one, each Arm is grouped within three weight classes: light, medium, and heavy. While a heavy punch will easily deflect lighter weight Arms in a head-to-head match-up, they're slow to attack, meaning that a lighter, faster Arm can attack that opponent by doing an evade to the side and then attacking. Different Arms possess different elements to them. By charging them, you can activate an elemental power in to your next punch, whether a punch that engulfs your opponent in flames, freezes them to completely slow their movement, or even shock them into a brief stun. Master Mummy's Arm attack is on fire thanks to him charging his Arm beforehand. From arc-flying Thunderbirds that shock and attack a foe from their flanks to Homies that zone in on their opponents before exploding, the Arms in ARMS have so much variation to them in the 30 variants in the game. While all ten playable characters begin with a selection of three, you can use funds earned in-game from battles online and off to engage in a target practice mini-game that allows you to win new, randomly selected Arms. This can be a pain when you want a specific Arm for a specific character since no doubt you'll uncover your favorites, but for me, many times I'd find that I'd go from loving one to discovering another that I instantly became enraptured with. It really depended on my opponent as well. This avian Arm variety closes in from the side. Better dash away, Ribbon Girl! Constantly I'd be up against opponents where I thought I had a solid strategy down in facing them, but then they'd unload on me with this crazy strategy that I had never thought of. The thing of it is, is that like there's no move that can't be countered, no strategy can't be countered either. You have to shift, you have to adapt, and you have to practice to improve. No more did I learn this than in ARMS' Grand Prix mode, the most basic of basic arcade modes in a fighting game like this. As I played through the beginning Levels, I was winning each series of matches with some issues. As I kept playing more rounds in the same Levels, my skills and knowledge of the game improved, so I could move on to Level 3 and later Level 4 (there are seven ranks in all). A week from starting with ARMS, I could hardly muster beating Level 2 computer opponents, but now I've beaten the AI in Level 4 to see the game's credits. It's not so much getting used to the controls, it's more practicing new techniques like successfully steering your punches into different directions to trip up your foes, jumping while punching, dashing after blocking a punch to counter, and so much more. It definitely helped me beat the Grand Prix's Level 4 more consistently, as the AI in general is one tough customer, as many players will tell you -- even on the most basic of difficulties. Unfortunately, Grand Prix is a very limited mode. You play through ten matches against all of the characters in the ARMS lineup as well as the upcoming free DLC fighter, Max Brass. Each fight has you needing to win two matches to move on before your opponent does. Thankfully, rematches are available if you lose. Some rounds involve ARMS' three mini-games, which will be talked about in a little bit. Later difficulties present you with the true final boss to battle against, and like a lot of fighting games, he's no easy pickings. Despite the initial fun of playing the Grand Prix multiple times, it wears thin, and since it's the only major solo mode available, it makes a recommendation for ARMS players who don't care for local or online multiplayer impossible to do. Outside of traditional one-on-one, over-the-shoulder battles, there are modes like V-Ball, which is a take on volleyball where the goal is to hit the ball onto the opposing side's court in any way possible. If the ball is in play for too long, it flashes red before soon dropping whichever court it's currently hovering over, scoring a point for the other team. Meanwhile, Hoops replaces basketballs for opponents. By grabbing an opponent, you can either slam dunk them for two points or throw them from further away for two or three (three only if you're on the outside portion of the court). Finally, Skillshot requires smart timing, usage, and control of your Arms to destroy as many targets as possible while avoiding the Arms of your opponent who is on the other side of the location of the targets. Hitting more targets with one punch of your Arm wields higher points than just hitting one or two at a time. 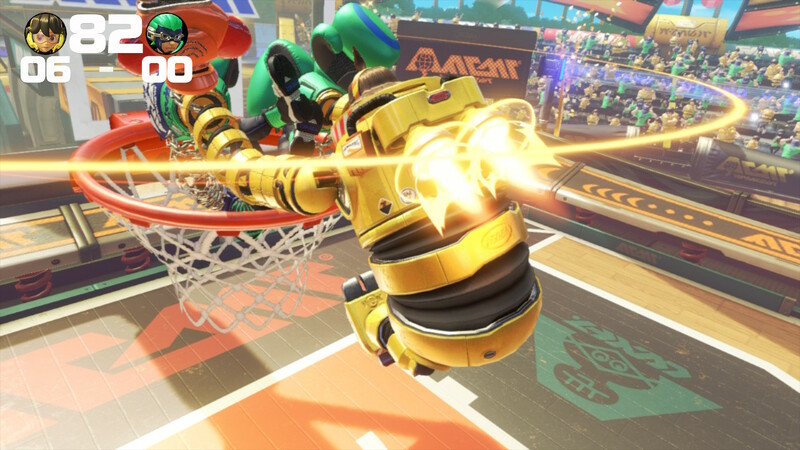 While not from downtown, Mechanica here has shown an incredible display of basketball ability nonetheless. A big feature with ARMS and a superb source of longevity for the game is its online offerings. Ranked Mode unlocks once you beat Grand Prix at Level 4 or above. 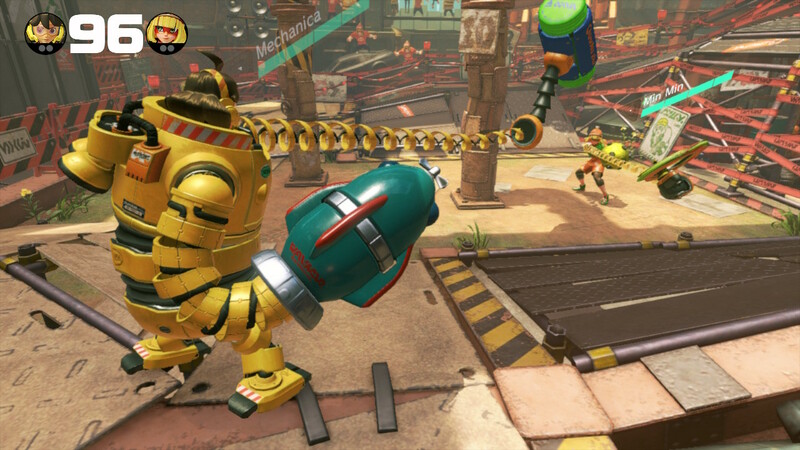 If you've managed to take on the AI opponents of the Grand Prix's highest levels, then you're ready to challenge ARMS' best of the best in ranked matches. Meanwhile, Party Mode is a more casual experience, having 10-20 players in one lobby. Matches happen on the fly between opponents for up to four players in one single match. The game's lobbies have it so players are paired between different opponents and match types constantly (such as 1-on-1, 2-on-2, 1-on-1-on-1, and free-for-all; as well as V-Ball, Hoops, and Skillshot) This make it so you seldom have a wait time while you're online. Even if you do, you can practice playing while in the lobby or happily look on to see health bars dropping, rage modes occurring, and when matches end. ARMS plays fantastically online with limited lag, a much better online experience than another Nintendo Switch online game, Mario Kart 8 Deluxe, which wasn't even that bad to begin with! 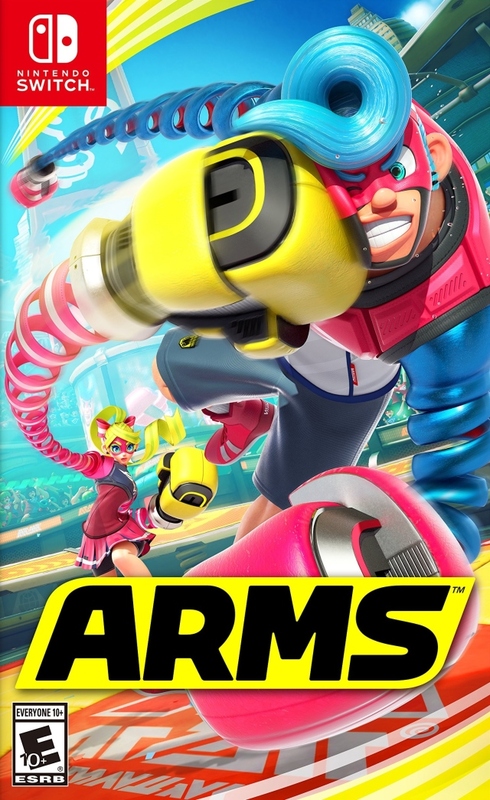 Finally, what makes ARMS so appealing to me is in the designs and abilities of the actual characters. Nintendo's designers have amassed a solid roster of fighter oozing with tons of style and even a little substance as each character's personality comes through in their designs. You have Spring Man, which is a bit of your Mario of ARMS, but his special ability is that his attacks are automatically charged up when his health drops to a dangerous amount. 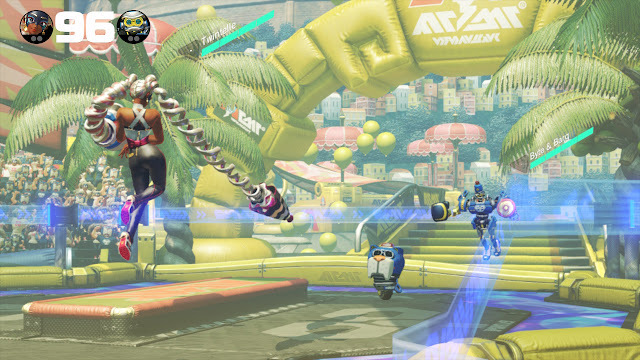 Then, one of my favorite characters, Ribbon Girl, can perform multiple jumps in midair to dodge attacks. Ninjara can vanish and reappear in between dashing to blindside opponents while the slow, tank-like Master Mummy can heal while he guards. Each character gets their own arena that is their home turf of sorts. Spring Man's Spring Stadium is surrounded by walls that can be leaped off of for getting a height advantage over opponents while Ribbon Girl's Ribbon Ring has collections of blocks that rise and fall, perfect for cover or also gaining height over an opponent. Mechanica's Scrapyard has destructible pillars as well as an elevated portion of the arena because as many Revenge of the Sith viewers know, it's important to have the high ground in battle. 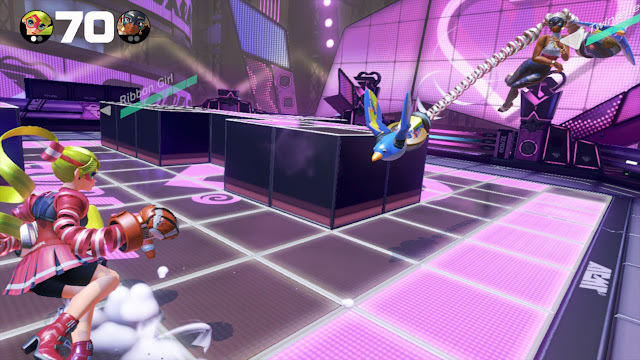 Likewise, some arenas aren't as fun to fight on such as Snake Park which revolves around hovering platforms that can move fast around the arena. It's too much of a gimmick that takes the fun away from and over-complicates ARMS' core fighting. 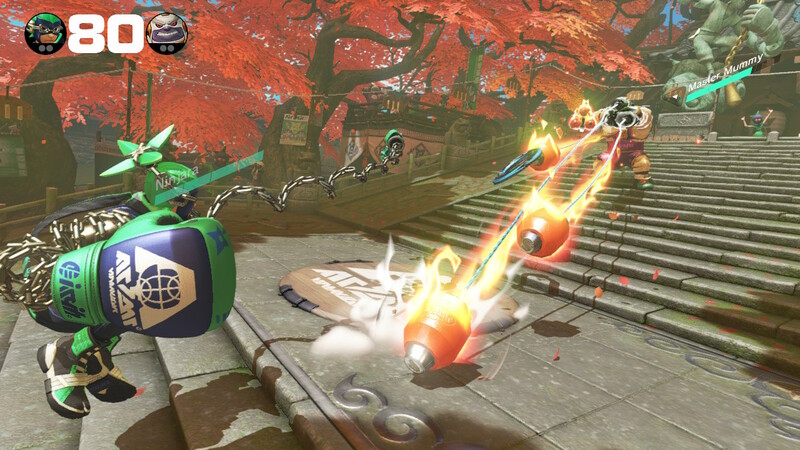 Min Min better watch out as not only is this Mechanica's home turf, but she doesn't have the high ground! For controls, ARMS offers pretty much every controller and control scheme to punch and pummel with. The only one not available is using analog controls with one Joycon in each hand. It needs the peripheral that connects them together for analog controls, meaning if you bought two sets of Joycons, you need another connector to both play locally split Joycon style. While the motion controls do their job (tilting left or right to move, punching in one hand to attack with that hand, punching with both to grab, and so forth), I find for higher level play the possibilities for mistaken maneuvers are much higher than if playing with analog controls. It's surely a load of fun to fly your fists forward to pummel a virtual opponent (and a pleasant workout), but for less casual battles, I preferred to use either the Switch Pro Controller, the Joycons attached to each other, or the Joycons attached to the Switch for handheld play. What's a better way to spend a summer's day than with a battle on the beach? ARMS is a tough game to recommend to anyone wanting a substantial amount of content right from the start. While more features are coming in free content, much like Street Fighter V and Nintendo's own Splatoon worked it out, what we have now is severely limited. The online is solid, and the fighting system is immensely engaging and deep for those who want the most out of it, but if you're bored easily when there aren't enough modes to go back to or new things to unlock, you'll quickly get tired of ARMS. The game is certainly worth playing, but wait until more of the upcoming free DLC rolls out from Nintendo. Otherwise, ARMS has its upper extremities taken care of, but its legs could use some strengthening.